Your Authentic Adventure Starts Here! Perched on the rim of the Snake River Canyon, the Twin Falls Visitor Center is the perfect place to begin your stay in Southern Idaho — and admire the majestic scenery. Our Space Is Your Space. The center is surrounded by green lawns so you can take in the Snake River Canyon, pack your BASE chute, or plan your next stop in Southern Idaho. Have lunch at our picnic tables and check out the native grasses and “melon” boulders that line our walkways and entry areas. On a bike trip? Park at our specially designed steel bike rack (it’s the one that looks like the I.B. Perrine Bridge). Discover Why We’re Magic. The Cooper Norman Agriculture Heritage Plaza, located at the entrance to the building, includes interpretive signage that tells the story of our irrigation, dairy industry, and the agricultural commodities that make the Magic Valley the country’s most diverse food basket. Check Out the Signage. Learn more about landmarks like the College of Southern Idaho, Shoshone Falls, and the Thousand Springs Scenic Byway through interpretive signage located outside the building. The Best Views In Town. The Center’s floor-to-ceiling windows offer stunning views of the Snake River Canyon, the 486-feet-tall Perrine Bridge, and the historic Evel Knievel jump site. Pieces of History. Don’t miss the historic Perrine Stagecoach, which once ferried guests from the Perrine Hotel in downtown Twin Falls to towns like Shoshone and Jerome and parts of Northern Nevada. Legend has it that I.B. Perrine, the original owner, used the coach while hosting Eastern investors and recruiting them to his dream of making the desert bloom. Plan Your Authentic Adventure! Inside the center, you’ll find everything you need for your trip in Southern Idaho. Discover historic photos, watch informative videos, and learn more about the four national park properties in our area. Talk to our staff for maps, travel guides, lodging deals, and locals-only recommendations. 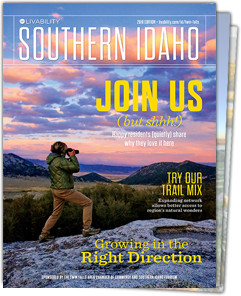 Make a Pit Stop.Fuel up on uniquely Idaho treats including Idaho huckleberry products, local confections and foods made right here in Southern Idaho – or grab a cup of free coffee on your way. Don’t forget a souvenir or two to remember your trip! Recharge Your Car. Did you know that Twin Falls is halfway between the major destinations of Portland and Salt Lake City? 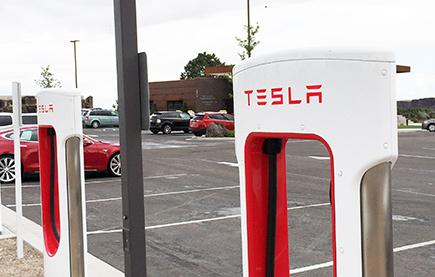 That’s why the Twin Falls Visitor Center is home to eight Tesla superchargers. They’re compatible with Tesla models S and X and are free to use. We hope you make the Twin Falls Visitor Center your home base while you’re in Southern Idaho. If you need anything, just ask! We’re here to help you plan a great getaway and learn more about our beautiful, historic region.